I got 2 in dundee store. I am looking for a 160GB, got no chance! Was roughly the same cost in Beckton East London a week ago, I forgot to post it. ​it's ok... it's always a hit and miss with asda deals. staff mainly take first dibs. Really? I got one today n the girl asked me what colour I wanted sayin silver, pink and blue were available. Sorry to miss inform! No stock in the Shirley store. ipod nano 16gb. £49.99 @ Waitrose Salisbury. as above. loads on the shelf. They were the rectangular ones. Still there tonight! Is it the latest gen?? 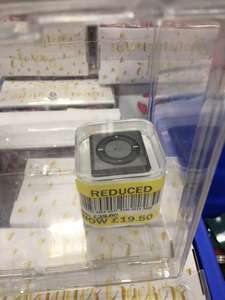 Never miss a 'iPod Nano' deal again! This is the cheapest I can see a Nano from a reputable merchant. Also over colours for a bit more. Glad it's not just me thinking that! Seems like a good deal to me too. Bought one and heat added. Thanks. 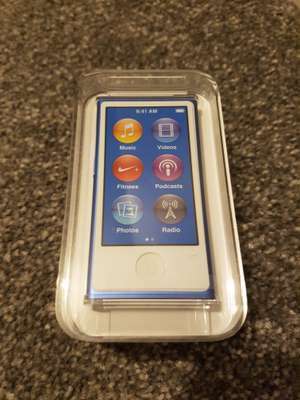 iPod Nano 16GB 7th Gen Blue - £94.45 (Green and Pink for £100) Sold by Equipement de Pointe and Fulfilled by Amazon. I'm looking for one and these seem to go for around the same second hand on eBay. I can't find it elsewhere cheaper at the moment. False deal, should be expired. Can't report via the iOS app... Price has gone up by £20! I'm not sure bud. My iPhone is jailbroken and I use an external app. I hate iTunes too. good price and post....but do I have to use iTunes with this? Not everyone has a smartphone. I'm buying this iPod for my mum to use whilst walking the dog &amp; she has a flip phone (which she won't upgrade). I'm a dinosaur. I have a 32gb ipod touch as well as a smartphone. Crazy, I know, but that's just me. For me having a separate device for music, is much more preferable than relying on 1 device. I do have some music on my smartphone, but I have a massive library on my ipod. 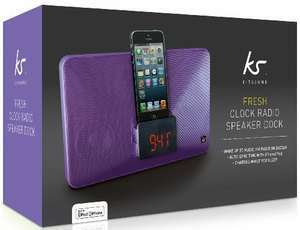 I use the ipod in the car, in the stereo at home, take it when we go away and use it with some mini speakers. For example, if I am going out and the missus wants to listen to music, I can leave the ipod with her and take my phone with me. I wouldn't want to leave my phone with the missus in case the girlfriend called. ;) Don't get me wrong, smartphones are great, but they are not always the best solution, for everyone, all of the time and that doesn't mean that you're living in the past. I do have one question for all of the hip and with it people. For those that just use a smartphone for everything and for those that drive, can you get away with using just your smartphone for all of the following when you're in the car, music &amp; sat nav simultaneously, if you receive a call answering the call using your car's bluetooth / handsfree, then switching back to music &amp; sat nav and so on? It clearly would be lighter and smaller, but having two items in one, is better than having two single items. Trust me, there is a time when you need both. Emergencies etc. 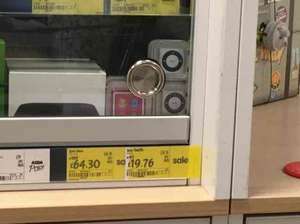 ipod nano 16 gb in purple @ Asda Derby Shared Via The HUKD App For Android. Apple Ipod Nano - 16gb - 7th Generation Shared Via The HUKD App For Android. According to the latest information there's still loads left in branches across the country, just not available for Click &amp; Collect any longer. Call 03456 049 049 to reserve one at your local branch. Does anyone still have a working code for this? Absolutely love my nano - would recommend! Blue is £106.56. Good deal for both. Sold by FRElectronics and Fulfilled by Amazon. Not sure if I need to add FRElectronics to the title or not. Iv phoned so many sainsburys stores. Def discontinued stock. Anyone able to get me one and I'll pay for the trouble. Lol. Phoned all around my area. I think they have stopped selling them and they were just flogging them off. Boooo. Well done for those that got them though. Awesome find. I got 2! Just give sainsbury's a call and check availability and if they're nice they'll reserve them for you. I reserved 2 and collected them the next day! They told me they weren't 7th generation on the phone but when I picked them up they certainly were! far cheaper than apple if you are in the market. not sure why the cold votes - HUKD sometimes doesn't make sense.